At age 37 and a World War II veteran, Master Sgt. 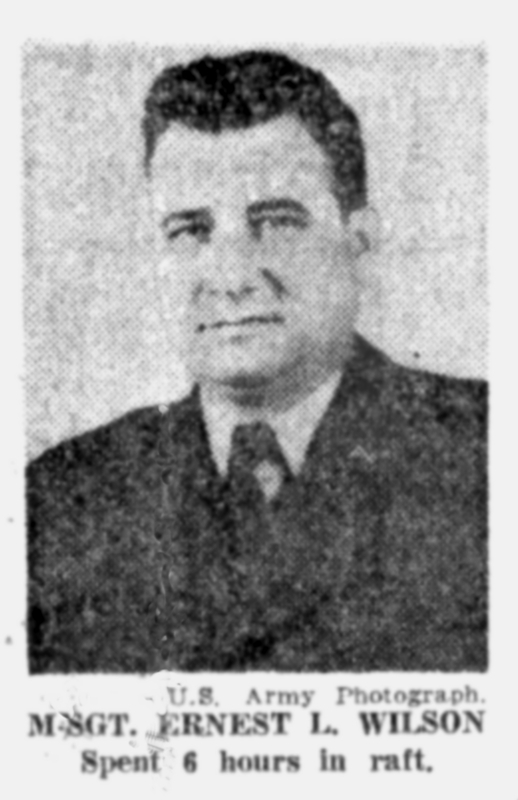 Ernest L. Wilson of New Orleans, was on his way to a new two-year assignment to an M.P. Station near Frankfort, Germany. That trip ended abruptly when the aircraft in which he was flying ended its trip in a mid-sea ditching, taking with it 28 other passengers and saving him along with 47 others. That was Flying Tiger Flight 923 on September 1962. M-Sgt. Wilson went home on medical leave soon after the incident and was interviewed by the Times-Picayune newspaper of New Orleans. Sgt. Wilson was alone that fateful day. His wife, Margaret, and their children stayed at home in the states because this new tour of duty was to be only two years instead of the three years of a tradition assignment in the past. He didn’t want to leave his daughter, who was soon to give birth, and take another daughter, Barbara Jean out of school, as she had just began her senior year in New Orleans. He told the reporter, “at 21,000 feet one of the engines conked out. The pilot told the passengers that with the loss of an engine, he was changing course for Ireland.” The plan was to go direct to Frankfort. Wilson said he and the other passengers weren’t too worried because they knew the plane could reach Ireland on the remaining three engines. But suddenly their confidence faded, when about an hour later another engine went out. As Wilson stated, “We were really shaken when that happened. It was going to be touch and go from then on. “Yes—but still a little reassured, as the pilot had already sent out the SOS distress signal. Everyone knew that a vessel had picked up their radio signal. “The pilot told us to expect two or three impacts. But there was only one, as the plane slammed into a 20-foot wave, which stopped its bouncing. Wilson, who had been seated on the right, was thrown out of his seat and into the aisle and knocked unconscious. The World War II veteran doesn’t remember whether he freed his seat belt. He said, “I understand someone threw me out the rear door. I wouldn’t know. Newspaper: How long did it take for the plane to sink? He added, “There wasn’t any screaming—but there was a lot of moaning, the kids and teenagers were crying. The water was covered with high-octane gas, which creates a strong chemical reaction with the skin. “All of us had first and second degree burns. Most of us had a five percent burn area on our legs. I sustained a brain concussion. Had cuts over and under my left eye, also a cut on the back of my head and one on my forehead. I also had a cracked vertebra and my right ankle was broken. Of course I had a lot of bruises. Everyone did. Wilson was hospitalized for 22 days and reported to his MP unit for about two months. He went home on a medical leave and in January was transferred back to the states to his old MP unit. M-Sgt. Wilson’s recollections seem to be quite different than a number of others going through the same experience. There was a lot of screaming in those first minutes in the ice cold water, until everyone got on board the raft that was going to get on board. There were only two children on board with their mother. All died. But that was an easy thing to get wrong. I thought there were at least a dozen. M-Sgt. Willson was there. That is a fact. And we appreciate the fact that he made it and was able to provide us with this story. — Editor. This entry was posted in passengers and tagged air crash, Earnest Wilson, Flying Tiger 923, liferaft, military Police, New Orleans, World War II. Bookmark the permalink.